In high school, especially in the spring during track season, my list of routines and prerace rituals was long and perhaps a bit obsessive. On race day I wore the same clothing to school - a red hooded sweatshirt, baggie boys jeans that had tons of decorative patches, a ball cap with a snail embroidered on the front... all the way down to the same underwear. I drank from the same water bottle (a mickey mouse one for whatever reason) and likely ate the exact same meals (although I don't recall those as clearly). For our racing, we had team uniforms, so I wore the same yellow-gold tank with navy TIGERS screen-print tank and shiny navy, shorty split shorts. I did add a special scrunchie, sports bra, socks and shoes that I wore no matter the weather -which is a huge variable in Washington in the spring. I always, always painted my toenails before a race... that is a tradition that I still carry with me. More recently, in 2005 (which is a long time ago now!) while amidst the Grand Slam, my old habits creeped back into life. Taking on the four 100 milers in 11 weeks was a bit daunting at 27 years old and perhaps the comfort of my rituals helped process. 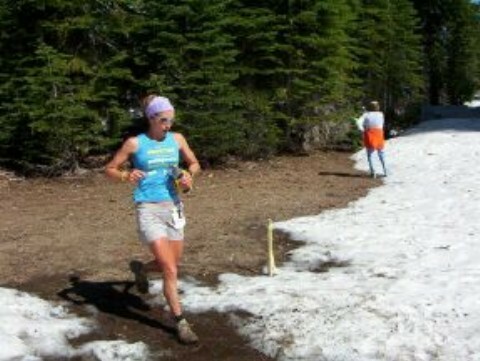 I wore the same Buff, tank, shorts, socks, shoes and yes underwear & sports bra for each race. If needed a yellow dragonfly (now called Houdini) was added to the kit. I also went as far as requesting the same bib number from each race director. Western States had assigned me bib 28 and I loved the fact that I would turn 28 after this series was over - each following race I contacted the race director and managed to secure bib #28 for each Grand Slam race. It went well. Amazing in fact. My Ma was at each of the races and Pa came to two. We got into a bit of routine as far as travel, race check-in (she would always crumple my number for me) and other aspects to keep things familiar and seemingly more possible. It seemed to pay off for both of us as we thoroughly enjoyed the summer together. We got to travel the country, and our time together & these rituals helped me not only manage the four races, but also to cope and deal with a lot of personal "stuff" that I was dealing with at home. And heck, the results weren't half bad either. 4th at Western, 1st at Vermont, 2nd at Leadville and 3rd at Wasatch. I think there is a baseball term that sums that up... but I don't know it... and I am youngest female to have run those four races and hold the second fastest accumulative time. The process of putting time into something, anything, making it important, studying it, loving it and creating ritual and ceremony around it simply adds value and importance to any task. As these running examples show in prepping for a race or adventure, when we choose to dedicate time to training, studying the route, asking questions of others, reading stories, prepping food and even creating a costume or kit for the occasion we are dedicating our energy, intent and purpose to a goal. Committing to the goal and putting your hopes, energies and desire is exciting! It is a choice to challenge yourself to your biggest potential. It can also be a scary thing - it may not turn out the way you dreamed. But if you do not dive in and give it your all, you will never know what may have been had you tried. You will never regret giving it your all. These are two examples of periods in my life where ritual has played an important part - these stand out in my mind, but I also know that these carry over in to every day life. Life is a series of choices and prioritization. When we choose to put our energies into something, anything we often amaze - ourselves and others.